Will Sony's gamble on a new actor in the iconic James Bond role turn "Casino Royale" into a huge hit? NEW YORK (CNNMoney.com) -- There is a new face in the familiar role of 007...and it's causing one of the bigger movie controversies in recent memory. 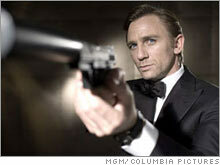 "Casino Royale," the latest film in the James Bond franchise, will hit theaters on November 17. The relatively unknown actor Daniel Craig is taking over as the British secret agent who has a penchant for martinis, Aston Martins and beautiful women. Some fans can't wait to see Daniel Craig take over as 007 but others think Pierce Brosnan should still be James Bond. And the casting of Craig has caused an online furor. Some fans support the choice of Craig and hope that his portrayal of Bond will be more like the spy they loved from the original Sean Connery films. But others have attacked Craig for things ranging from his acting choices (he played murderer Perry Smith of "In Cold Blood" fame in this year's "Infamous" and has a scene where he kisses Truman Capote) to his looks. He's the first Bond to have blond hair, for example. Will Daniel Craig be a hit as James Bond? According to movie industry research firm BoxOfficeMojo, Sony is the most successful studio this year, with about 18 percent market share of ticket sales in the U.S. So will Sony have another huge hit on its hands or will Daniel Craig wind up being the next Timothy Dalton or George Lazenby? Blond, James Blond - Will Sony's gamble be a huge hit?